Departing the Country – The Plan. My departure out of the country as a traveling nomad has arrived. About a year in a half ago I decided on the destination where I was going to start. I took a long time contemplating and studying maps of where should I start and what would be a tentative route. I did decided I would rather stay on the ground for the most part, not that I dislike flying, I love flying, just that I would rather walk, take the bus, train, or a boat, from place to place. I also thought about who’s foot steps, of a historical figure, would I want to follow. Due to the fact that I have studied history all my life along with archeology on an independent level; I have chosen the second oldest city-state civilization as known in mankind’s history. Sumer was the first city-state civilization, which blossomed with a precipitance around 3500 BCE. 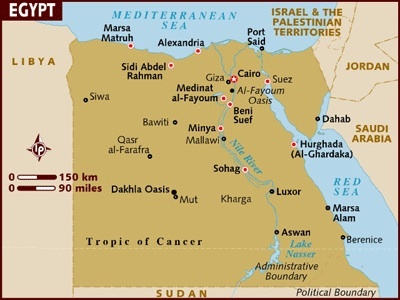 Egypt was the second which happened around 3000 BCE as a city-state. Egypt is the choice I made in February 2006. I bought my one-way airline ticket for $650.00 last December. One other reason is that Egypt will be a very inexpensive place to start. I might be able to live just on my interest most months, hostels cost about $1.50 per night. The hotel I reserved a year ago will only cost me $50 for 5 nights which I have my own room with a shared bathroom. I got my own room for recovery from the jet lag. Who’s foot steps did I think of walking in? The only person I could think of is Moses; the man that wrote down the commandments of human behavior. A historic person I have always look up to and have taken lots of time examining his writing style and figuring out what he taught. Sad to say the world teaches the complete opposite of what Moses taught. I am flying out of San Francisco with a direct flight to Amsterdam. I have a ten hour layover in Amsterdam, which I am fine with. I have been to Amsterdam before in 1994. I am going to go into town and visit the Anne Frank House, get lunch, hang out, and head back to the airport for a nap. My connecting flight is at 9 pm arriving in Cairo at 2:30 in the morning. Why they have flights come in at that time is beyond me, a least there wont be a traffic jam on the way to the hotel. I have it arranged for the hotel to pick me up at the airport, I don’t want any hassles at that time of the morning. I have thoroughly researched want I want to do and see in Egypt, I am going to have my visa extended for six months, which they say is very easy to do. The plan is to stay in Egypt for six months then head to Jordan for three months which is the max stay in Jordan. After Jordan I will head to Israel and stay six months depending on getting the visas extended. There is good chance I might buy a pedal-bike and bike Israel, we will see at that time. I might do some organic farming in Israel, most farms make yogurt and cheese from goats. From Israel I hope to take the boat to Roades or Cypress, Greece; that would be around February of 2009 if there isn’t any detours in the timetable and visas. I could stay in Europe for two years depending on the organic farming and resources that cross my path, I am also willing to work under the table for money. When I leave Europe to travel east, I will be taking the Trans-Siberian railroad east through Russia, Mongolia, to China. That will not be until the summer of 2010 or 2011. From China, after visiting Tibet, the tentative plan would be to go south to southeast Asia and head toward India on the ground. The countries on the way will be Veitnam, Cambodia, Laos, Thailand, from Thailand the question will I stay on land through Burma to India, I will decided at that time. From India I don’t have any plans. The plan has been to stay on the ground. Of course most of this is tentative except Egypt, Jordan, Israel, and I will be taking the Trans-Siberian Railroad east to China, never know when and where I might end up. I will update everyone once in Cairo. Chow, Cheers, Have a good one, Take care. The next time I will be posting I will be in Egypt. Life is all about the moment. Next post: The Arrival, Cairo Egypt! Previous post: The Tied Loose Ends.